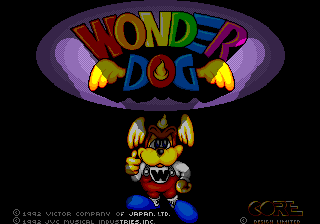 Wonder Dog (ワンダードッグ) is a platform game for the Sega Mega-CD by Core Design featuring Wonder Dog, a mascot for Victor during the early 1990s. Core Design later ported it to the Amiga for a Europe-only release. Controls are similar to Super Mario. shoot a Star, jump. Accelerate moves with pressing . Main article: Wonder Dog/Magazine articles. Main article: Wonder Dog/Promotional material.